Having bounced back with an emphatic victory in the previous round, Indian Grandmaster Viswanathan Anand holds a huge psychological advantage in the crucial remaining four games of the World Championship match against Israeli Boris Gelfand. With points levelled at 4-4 and with four games to go, the championship match is interestingly poised. The eighth game provided the Indian ace a much needed breather after a shocking loss in the seventh game and the manner it came was something that's bound to dent the confidence of Gelfand. In a way, this match was reminiscent of the 1995 World Championship clash between Garry Kasparov and Anand that the latter had lost in the end. The first eight ties of the 20-game match had then ended in draws and then Anand had drawn first blood thanks to some careless play by Kasparov. What happened from the 10th game onwards is history. Kasparov was well prepared in the opening and outclassed Anand in all departments of the game. Playing the first 20 moves in under five minutes and infamously banging the door some time, Anand lost that and was shaken to the extent that he blundered and lost again in the 11th game. The Indian ace ran for cover, but did not succeed. What was 5-4 after nine games became 7.5-10.5 after 17 games. The match was over. Seventeen years later, Anand finds himself in Kasparov's shoes against Gelfand. In the first six games, draws, some very dull, were the order of the day. Anand had been patiently waiting for his chances and came close in the third game. A slight slip and another draw happened. Perhaps, for the repeat of the opening of third game, team Anand needed some ammunition. And apparently they got it to be used in game eight only. This time Gelfand, apparently confident like Anand was 17 years back, went for something that he had not analysed deeply. A shocker on move seven by Anand and Gelfand replied after a little thought. Just 10 moves later, Gelfand resigned, falling in to what the chess pundits have acknowledged as a devilish trap. Anand now plays black in the ninth game on Wednesday after a day's break in the USD 2.55 million Championship. Gelfand will have to rebuild from scratch which is not easy for a challenger who, at 43, is in all likelihood playing his last World Championship match unless he wins it. For the Indian, this is simply turning out to be a roller-coaster ride. 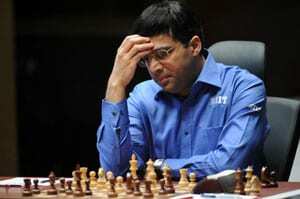 Many pundits had expected a runaway victory for Anand in the match. That certainly has not happened but he can now take solace from the fact that for once his idea has clicked incredibly well. Gelfand was a picture of confidence coming into the eighth game. He put up a brave front after the loss, even occasionally invoking laughter from the pressmen in the post-match conference yesterday. If he was disturbed, he did not show it. Meaning that he intends to fight till it's all over. Anand will be hoping for an encore with white pieces. As black, the reigning world champion is now expected to be very solid.